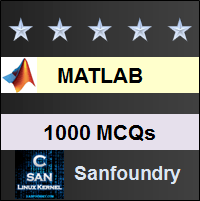 This set of MATLAB Multiple Choice Questions & Answers (MCQs) focuses on “Loops”. 1. What is the default increment value in a for-loop? Explanation: When we are going to start a for loop in MATLAB, it is not necessary to assign a specific increment value. The default increment value will then be taken as 1. Explanation: We have put a semi-colon before ending the inner for-loop. So no output will be shown after ending the outer for-loop. If we want to see any output, we will refrain from placing a semi-colon at the end of that line. We can choose to place a semi-colon at the end, then the matrix won’t be displayed after every input. 4. What is the size of i after the following code is run in MATLAB? Explanation: The above loop does not run because the default increment value in MATLAB is +1. We have to assign a decrement value separately if we want the index value to decrease for a for-loop. If we set a decrement value of -1, the loop will run for 5 times and the final value of i will be -1. No output will be shown due to a semi-colon but the question is what will be the size of i. 5. A break statement will leave the outer loop. Explanation: In case of nested for-loops or while-loops, the break statement will remove control only form the loop where it was invoked as a command. It won’t come out from the outer loop. 6. How many times will the following loop run? Explanation: The for-loop is not terminated. Any statement or a group of statement, in a for-loop, will be executed effectively only after the end statement is used to terminate the loop. 7. What is the nature of the following code? Explanation: We find that the inner while loop goes into an infinite loop. MATLAB is unable to compute the value so it returns j=0 as was initialized. The same goes for i=1. If there was no while loop, option i=8 & j=36 would have been the output. There is no error in logic. Output: No output will be shown since we have placed a semi-colon after j=j+i. But the workspace will store i & j as 1 & 0 respectively. 8. A for-loop can have multiple index values. Explanation: A for-loop has a single index. But it has multiple index-values during successive iterations. 9. There can be multiple decision variables for while loop. Explanation: We can provide multiple conditions to end a while loop. The conditions can be different so we can have multiple decision variables for while loop. 10. What will be the output for the following code? Explanation: We find that i become 0 at the end of the first iteration while k becomes 1. Since k<1 is a condition for the while loop to terminate, the while loop gets terminated. In case of multiple condition, the while loop will be terminated even if one condition is satisfied. 11. How do we break from an infinite loop without keeping a break statement within the loop? Explanation: If we begin an infinite loop, by choice or as a silly mistake, we can terminate the loop manually if we forget to introduce a break statement as necessary. We can choose to press Ctrl + C and the loop will get terminated at the same instant. 12. What will the following code do? Explanation: We observe that the while loop will enter into an infinite loop. Hence the final value of i and j won’t be determined by MATLAB. MATLAB will retain the values for i and j as they were initialized. Hence j will remain 0 and i will remain 5. There is no error in the code.